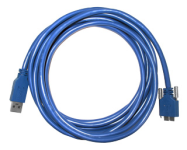 Our USB 3.0 cables are built for industrial environments. Rugged construction with additional shielding reduces radio frequencies and electro-magnetic interference. One end has a USB Micro-B screw-lock connector. The other end has a standard USB Type-A connector. Recommended for use with USB3 Vision cameras.